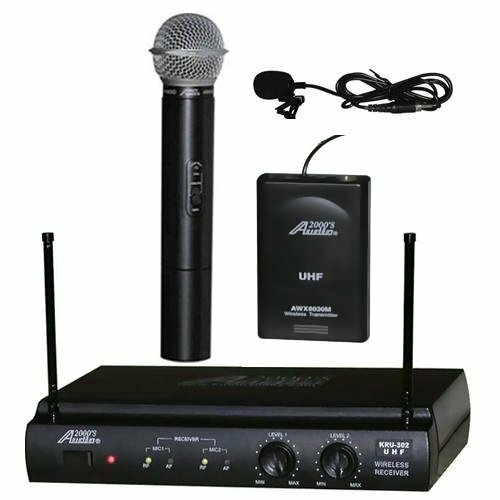 As all the other Audio2000 wireless products, the AWM6032U system has been engineered to be dependable UHF system with a wide audio frequency range, high S/N ratio, and outstanding performance equal to that of any professional wireless systems costing much more. This is achieved through strict component selection and high quality circuit design. A delicately designed silence circuit eliminates static noise when the transmitters are either turned off or out of transmission range. An auto mute circuit is incorporated in these systems to effectively eliminate the popping noise when the switch is turned on or off. If you have any questions about this product by Audio2000, contact us by completing and submitting the form below. If you are looking for a specif part number, please include it with your message.